Event – Greyhounds in Gettysburg! 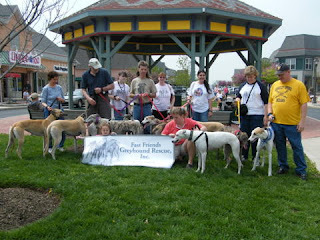 Join Fast Friends Greyhound Rescue, Inc. for the thirteenth annual Greyhounds in Gettysburg! If you have never attended this greyt event, please consider it this year. If you are looking for a fun event to enjoy with your hound(s) you will not want to miss this event. Two and a half days of activities are planned beginning at noon on Friday, April 29 and running to noon on Sunday, May 1. Approximately 40 vendors will be available on Friday and Saturday to sell greyhound related merchandise. Our organization will be vending this year for the third year. Come and see all the great merchandise! This event is truly a shopper’s paradise. Special activities for the whole family run thoughout the day and into the night as well. This has become one the of most popular events on the east coast in recent years and it gets larger each year. When you are not participating in greyhound related activities, you have all of historic Gettysburg and surrounding countryside open to you. Gettysburg was the pivotal battle in the Civil War. You can visit the battlefield, museums and the historic town to discover more about this historic battle and the men that fought here. On Site Registration will be available on site at the GIG Information Tent at Outlet Shoppes at Gettysburg, Friday, April 29, 2011 and Saturday, April 30, 2011. For more information about this event, please click on the title of this post and it will take you to the GIG web site. We hope to see you there!! !